I now carry a picture of my beautiful wife in my wallet. Actually, it’s her senior picture from high school, which is some years before I knew her. But it had floated atop a box full of her old cassettes for years, and one day when I was looking for old cassettes to play for our children, I finally copped it and stuck it into my (bifold) wallet. This just in: She is more beautiful now than she was then. Unless, of course, such a statement would get me into trouble with her now. In which case, I, uh…. Dynamic pricing is all the rage on the Internet these days, as online sellers like Amazon inject algorithms designed to extract as much money from each customer as that customer might be willing to pay. Instead of a grocery store, with a fixed price on an item, Internet Web sales sites are now more like car lots, where you won’t get the best deal unless you’re willing to walk out, virtually speaking, without what you want. For example, Amazon is very happy to offer you a price on an item, but if you leave without checking out, you’ll find the next time you come back that it’s unexpectedly cheaper. Amazon will even call you back like a car salesman does on a slow day. Well, it will email you to let you know that it’s got a better price for you. I’m just waiting until Amazon tells you it wants to ask its manager if it’s possible to get you into that DVD for $4.99. Then, maybe, I’ll splurge on a trio of films that I won’t end up watching until I find a functional secondhand DVD player in 2033. I’m just an old man, but the whole dynamic pricing thing just seems like another way for companies to try to take advantage of their existing and loyal customers. And it does not build good brand equity or give me the urge to buy a bunch more. I live in the country, and I hate this time of year. Parents who have gotten their children hippopotamuses for Christmas start thinking that maybe, maybe they want to park their cars in their garages again or maybe they’re tired of the zoolomasseuse bills, but they start bringing them out in the country and leaving them alongside the highway. People, hippopotamuses are not native to the Ozarks, and they have not evolved to survive on the local flora. I just shake my head when I see one lying beside the road, and it makes for dangerous driving if they topple into the roadway. Freeing the hippopotamus that your child wheedled you into for Christmas is not humane. It is not right. Think before you buy based on one silly little holiday ditty. The Past Is Still With Brian J. My first computer was an Atari 600XL, a 16KB model with a cartridge slot and no disk drive which my parents suffered through a high-pressure time share sales pitch to obtain for me. And I loved it, not so much for playing the cartridge version of Star Raiders (though I did that, too) but because the machine opened the door to BASIC code and to writing one’s own programs. It was like a LEGO kit for the mind: if you could think it—and squeeze it into 16KB—you could build it. But how to save these masterpieces? I quickly acquired a finicky, used tape drive to store my programs on standard cassette tapes, picked up some books from the library, and I was off, coding versions of “Hunt the Wumpus” and other early Unix delights that had been ported to BASIC for the new breed of home computer user. Then, as I was browsing the magazine rack at our public library one day in the mid-1980s, I came across a wondrous magazine called COMPUTE!. It contained cutting-edge programs—including plenty of games—with decent graphics. And the code was all free. I quickly grabbed every back issue the library would let me take and headed home. Compute’s Gazette, which was Compute! Commodore 64 magazine. Commodore Power/Play and Commodore Microcomputers, two titles that alternated months and focus between serious computing and games and eventually merged into the single Commodore title. A bunch of sundry other titles from back in the day, either part of a subscription or picked up later at garage sales or book fairs for the nostalgia value. Strangely, I don’t appear to have saved any Ahoy! 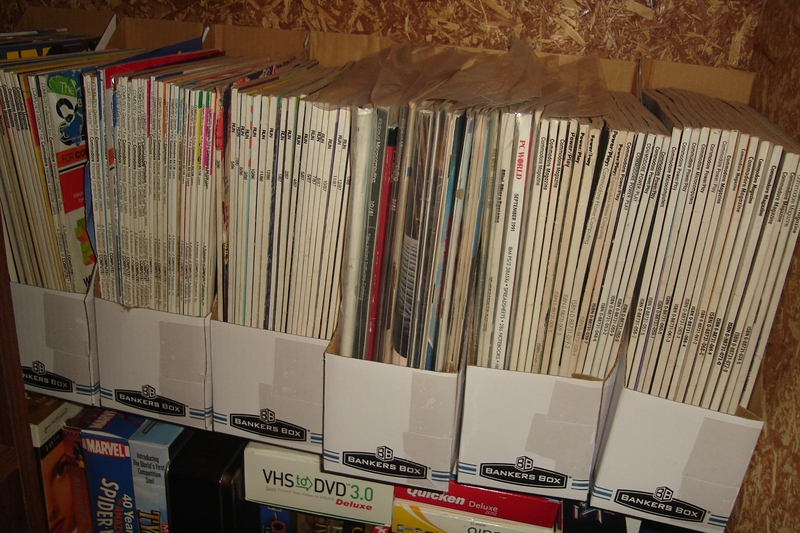 magazines, which I also got or picked up on occasion. I don’t remember which it was. The first three titles have type-in programs, many of which I typed in. But I don’t have to type them in again. I still own the 5 1/4″ floppies that I saved them on 30 years ago. It’s been a couple years since I fired the old Commodores up, but the disks were still readable then. I have faith they still are now. But that’s not entirely what I mean by the past is still with me. When I want to learn a new programming language from scratch, I’m still prone to buying a Teach Yourself [language] programming books that have a sample program that you can type in over the course of the book. Of course, they don’t really teach you much about developing in that language except how to develop that program, but I still type along with the chapters. When I’m trying to pick it up from scratch. When I’m on the clock, I’m all about getting something done quickly, so its Internet forums and reference books (in Ruby these days). But I still pick up the books and type along when I don’t have to do it right now, and I type along. And then I abandon it when the checksum fails and I can’t find the typo. Just like the olden days. That’s based on a mispronunciation of Jaromír Jágr, a player in the National Hockey League ten years ago when my beautiful wife and I watched a lot of hockey. And he’s back. He’s going to turn 41 next month, and he’s playing center for the Dallas Stars this season. Given that the oldest boy is starting to pay attention to hockey and very well might see the Dallas Stars in action, he will not only remember that thing that Daddy always says, but he might have first hand knowledge of watching the player who inspired it. And does any other vegetable get that kind of love? It’s been a while since I’ve read a Bob Greene book (five years, I guess, since I read All Summer Long, his novel, and He Was A Midwestern Boy On His Own, a collection of his columns). Wow. Five years. I remember reading them in my reading lair in Old Trees. When I had a fulltime job for The Man and a toddler and a baby on the way (or soon to it). One can’t help but look backward when reading this book; whereas Greene’s normal fare wallows in a certain sentimentality, this volume looks at growing older and tries to weigh a balance between the things you gain when you’re turning 50 and the things you’ve lost. Well, the things Bob Greene gained and lost. And though he tries to balance it, he’s not a fan of growing older. One cannot read the book without remembering the sordid story of his downfall. With that tone over it, you can see, yeah, he was a man who missed his youth and spent a lot of time missing it. So here I am, a man of 40, reading this downbeat book and feeling a bit maudlin about it. Bob Greene writes about lifelong friends, people he knew in kindergarten. Me, I think back to kindergarten, and I can’t remember any of the other white kids in there, but there must have been some. As to lifelong friends, the friends I have don’t reach back to high school. Come to think of it, in England, you can sue for libel over charges like “This person is Brian’s friend.” Or start a fight. I’m not sure which. Another thing struck me about this book as I read it: Bob Greene was married when he was writing the book, but the book nor what I remember of his columns ever mention his wife. He’s got little domestic scenes peppered through the book, but they’re always of him sitting down with a television dinner, a beer, and a basketball game or something. You’d be forgiven for thinking he was a bachelor. I don’t know what that’s about, but it didn’t exactly elevate the level of the book. So of the Greene books I’ve read, it’s not my favorite. 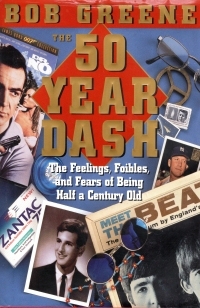 It took me a couple of seasons to read it, partly because the topical-by-chapter musings were meandering and disconnected, which meant when I hit a point where I’d had enough, I could put it down without really losing my place. So if you’re going for the Greene, go for one of his collections of columns and not this sort of thing. I’m not very encouraged by his Wikipedia page‘s description of his recent books, which sound more like this than his columns. It’s been long enough since October that my consumer goods’ packages are finally returning to their normal colors. This book is the second of three I received for Christmas from my beautiful wife, and it actually precedes The Sentry, but the events within the books are not so developmentally tied that you can really tell. Crais is keeping the novels episodic enough that you can pick them up in pretty much any order. Series business doesn’t make them a jumble if you read them out of order, and that’s might be something that keeps the casual reader who picks the series up more interested in reading earlier books instead of just following the series from the point of entry forward. Or maybe I’m just making that up. One could probably get a government grant for some scientific study on it, but where would one find study participants? At any rate, this book deals with Joe Pike and his sidekick Elvis Cole (series readers will see what I did there) investigating the death of one of Pike’s former mercenaries at the hands of a home invasion crew run by a Serbian mob. As he investigates with an eye on vengeance, he’s driven to help an ATF officer on the trail of some missing AK-47s. Real ones, with automatic fire and everything. So he investigates, happy to find his friend is not involved in arms dealing but that his death was a by-product of the Serbians running the home invasion crew wanting something from the Serbian nanny. It’s a mess of a plot, and the protagonists slowly unravel it. The book’s got a little wheeling-and-dealing with the mobs and a little humanization of Pike, but not too much to tip the book out of a very sweet balance. As I said in the report on the earlier (later) novel, I enjoy these books at a bit of a deeper level than other recent crime fiction I’ve read. 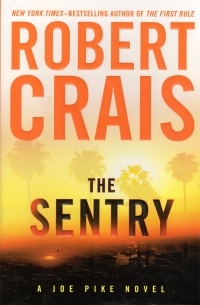 It’s a shame Crais isn’t more prolific, but when you’re prolific (like Robert B. Parker was), you get all the flaws of thin novels, so I’ll just take what Crais dishes out slowly. Well, eventually, when I realize several years have passed and I ask and get them for Christmas. As I said, we get those daily even though 1) We’re on the no-call list and 2) Calling people on the no-call list is illegal. Sure, when state governments got the company behind Rachel from Account Services, that stopped them for a little while and that particular flavor of illegal call has stopped, but other companies continue to ply the illegal trade. Kind of like gun restrictions, hey? People who follow the law follow the law, and people who do not do not. And making the people who follow the law follow more laws does not make the people who do not start to follow the law. That’s QED stuff there, but in the Internet age, QED is a punchline marker. Back in the olden days, circa 2001-2006, I could receive WSIE, the jazz station out of Edwardsville, Missouri, on my radio in my home office in Casinoport. I spent a lot of time listening to Laverne Holiday, Ross Gentile, Adam Tracy and Buddy Moreno, and E.B. Stevenson. I spent a lot of time in the office those days, since my hobbies included a lot of computer things (eBay, writing the novel, and starting this blog) and my first experience as a remote worker took place in that period. When we moved to Old Trees, either the increased distance to the Southern Illinois University – Edwardsville or the plaster-and-lathe walls prevented the radio station from reaching my receiver, so I had to go with the KFUO classics station on the main receiver. It was okay; I was spending less time in those days in my office, since my career and my hobby went more toward being a daddy. Back in the Casinoport days, I’d bought my beautiful wife an AirPort Express, the little wireless gizmo that would allow you to pipe songs from her Macintosh to the stereo receiver in the next room so she could listen to her ripped music while she crocheted. She did that a couple of times, but ultimately that gift was as useful and timely as the 100-disc CD changed I’d bought her a couple of years before ripping music to the computer became the norm. I didn’t get much from it since I wasn’t ripping my music to the computer back then (I’m not what you’d call an early adopter). Besides that, in the dark family room in Casinoport, where I preferred to read, and in the lower level of the home on Old Trees, where I preferred to read, I had a DirecTV receiver, so I could listen to The Savoy Express or other stations on Sirius (later SiriusXM) and later on SonicTap as DirecTV and its partners cut costs and playlists. So that held me over. This month, we cut our DirecTV. We were going to cut it altogether, but the retention office offered us $30 a month or some such with the free NFL package next year, so we kept it (we’ll see if they keep their part of it; I get the sense that after the fees and taxes are added on, our $30 a month will almost be the original price). But the move removed the music channels from the selection. So I was a bit at a loss. Except several factors converged: WSIE now has a live stream on the Internet. I have a Macintosh with a wireless card of my own. And we still have that old AirPort Express; we even had it hooked up to the receiver in the family room, but it was not plugged in. So I set to work last night configuring it. I’d had some dread about doing it, as with those things that you configure once every couple of years, you forget the password and have to reset it to factory defaults to get it hooked up. But I started the efforts last night, with plugging it in, resetting it, getting my Mac to see it, rifling through old Apple documents and help forums on the Web, and trying to figure out the default password or how to reset the password and not seeing the prompts on the screen that the manuals said were on the screen, and suddenly (to me), my wife revealed she knew the password since she had configured the AirPort in this very house to stream music from her Mac, although she probably only did it the once to make sure it worked. And suddenly, six years later, I can listen to WSIE while I read. Brothers and sisters, I cannot express how happy this makes me. It’s a taste of a pleasant period in the past, which is always more stark in relief than the pleasant things in the present which are mixed with unpleasant things in the present to kind of obscure them, at least to me. But jazz in the living room, albeit not the locally produced and disk jockeyed jazz of the Casinoport era (the station let go its local DJs in 2009 to save money). But, ah, I can get WSIE (and KCSM, for that matter). (Couldn’t you have just streamed Pandora through the Roku?) Baby steps into the 21st century for me. Baby steps. (Haven’t I read this post before?) I did post a similar history when I found the WSIE live stream last summer. I was never a Cub scout. Oh, I attended an organizational or informational meeting for it, once, in about the second grade. My mother, my brother, and Boogie and his mom went down to a church on Teutonia to hear more about it, and we were very excited about it, but it required some sort of financial outlay, and we couldn’t swing that back in the government cheese days. Fortunately for me, this book can help me overcome that disadvantage, at least as far as tying knots goes. I mean, I know two knots, basically: a slip knot and a double reversed slip knot that I think my father taught me as a square knot. So when it comes to tying things down in my truck, for example, I’ve had to rely on them. With success, fortunately, so far. But this short book contains a menu of 24 knots and includes cardstock pages through which you can lace some string to practice the knots in a helpful, step-by-step manner. It’s not quite as good as having someone there to help guide you, but it’s better than a mere set of photos alone. Which will become important when it comes time for me to pass on generational knowledge to my children, knowledge whose knowing I’ll have to get from books instead of getting them from actual, you know, preceding generations of my forefathers. Sorry, I was talking about a book here before I somehow wandered into a self-involved bit about growing up in a broken home. As you can guess, it’s not a long book, but so it’s a quick run through. But it’s a solidly constructed piece of work, coil-bound and on cardboard so you can practice. I’ll probably keep the book on my desk so I can practice some of these knots while I watch a process run or such. A little bit of practicing on something every day to get better at it. Something I never learned to do. Probably because I was the product of a broken, government cheese kind of home as a youth. Or more probably because I have quite a touch of the lazy in me and always have. 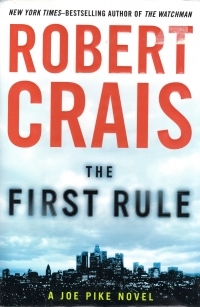 I admit, I fall behind on the Robert Crais reading. I don’t know why I haven’t been seeking out his books at the library like I have John Sandford’s (until recently). But I haven’t. I read Chasing Darkness over four years ago. But when I fall behind, my beautiful wife is there to provide me with nice hardback copies of the books for Christmas, like this one. And I read it promptly. It’s a Joe Pike-centered novel, where Joe runs into a crime in progress and intervenes, only to learn that the victim is on the run from a vicious, relentless killer who has been looking for his targets for years. Joe’s heart goes pitter-pat, such as Joe Pike’s heart does, over the “niece” of the victim who really isn’t his niece at all. So the basic outline of the book is that Pike and Cole try to uncover who these people are and who is after them while also trying to find where they’ve run to next. It’s pretty standard stuff, but I rather enjoyed the book. I got the feeling that I did when I read the old Parker books: I wanted to be like the protagonists. I aspired. It’s not something I tend to get from the Davenport books or the John D. MacDonald one-offs, or even the Executioner series. My beautiful wife gave me three of these books, and I’m looking forward to reading them, not just finishing them. I have not eaten any of my children’s Hallowe’en candy yet, although I have chewed some of the gum. I have, however, begun to consume some of their Valentine’s Day candy from last year. Some of those apple Now and Laters were beginning to sprout. We don’t eat a lot of candy here at Nogglestead. And by “We,” I mean “the children.” “We” being “me” eats plenty. A year later. RTZ included elements of Boston back when they were on hiatus from Boston. You’re forgiven if you confuse them with The Storm, which was composed of elements of Journey while Journey was on hiatus and had its one hit (“I’ve Got A Lot To Learn About Love”) at about the same time as RTZ had its hits. At any rate, what’s so hard about this song in the meta is that it’s sung by Brad Delp, also the lead singer of Boston, who committed suicide in 2007. So it’s not as encouraging in toto as it is in text. If the United States government hits its debt ceiling, members of Congress and elected and appointed members of the Executive branch must sell plasma to fund further spending. And they don’t get to have cush doctors brought into the halls or office buildings of the capital to take their plasma while our ruling class sits in leather chairs getting foot massages from corporate and nonprofit lobbyists. No, they have to go to the same weather-beaten places downtown where all the other tapped-out citizens go. And, as befits them as members of the ruling aristocracy, they are exempt from limits imposed on ordinary citizens. To whit, they can sell as often as they like. I know, you’re saying, Brian J., you Lothario, did you woo that beautiful wife of yours with an awesome mixed tape back in the day? You bet I did, son. You bet I did. I found this in the cassette holders that adorn her office walls. 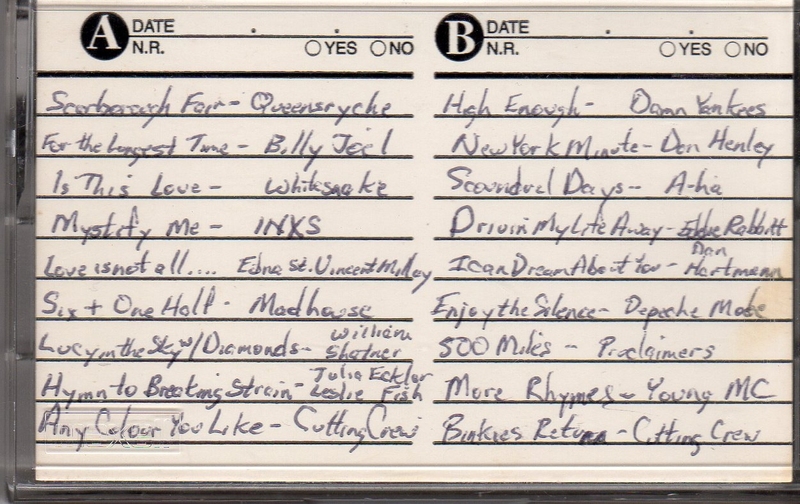 The label, “Lil Didde Mix”, refers to the Didde-Glaser printing press I was operating at the time. Something like fifteen years later, my taste in music hasn’t changed. My taste in a woman, either. You always hear them going on and on about how good antioxidants are. You ever hear them even mention the pro-oxidant side? Fire officials say they also saw a record number of fires caused by careless smoking in 2012. The number of those fires rose nearly 23 percent (88 in 2011 to 108 in 2012). Large fires at Chardonnay Apartments and Lakeshore Apartments were started when tenants improperly disposed of cigarettes on wooden balconies. Six residents died as a result of fire in 2012, compared with four in 2011. Both are higher than Springfield’s average of 3.2 fire deaths per year. You don’t say. I wonder what might have driven smokers outdoors in greater numbers this year? This book smells like the 1970s: it’s an inexpensive paper and an inexpensive hard binding designed for school libraries. Or maybe that’s just how they did it in Great Britain in those days. I dunno. It’s got a bit of a musty odor that it shares when you read it. 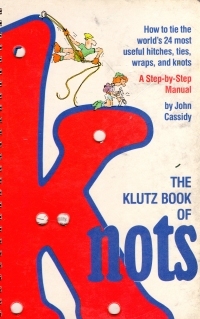 As the title says, it’s a a book about how to take a couple of sticks, some paper, plastic, and/or other material, and string to make a kite. 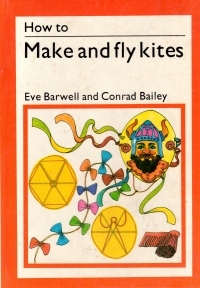 Like most craft books, it starts out with basic techniques and moves to specific projects of different types of flat kites (box kites are not included). Also, note that the book does not include directions for embedding glass in your kite strings, so no fighting kites, either, children. But it’s something interesting to consider as a project to work on with one’s children. You could go to the drug store and buy a wing-style plastic kite for two dollars, but if you really want to make an impression in their future memories, you can take a couple dowels (or better yet, tree branches) and do the same thing. Maybe I’ll do that one of these days. At any rate, this book is only 28 pages, so it’s not a grand tome on the history of kites through the ages (which is what it would have been if it had to be padded to an adult craft book). It’s just sticks, papers, designs, and some instructions on flying a kite. A simple pleasure, or so I remember.